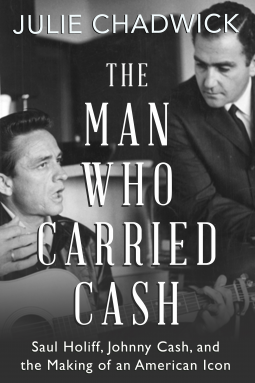 Coming at an iconic figure like Johnny Cash from his long-time (and in some ways long-time suffering) managers point-of-view, Julie Chadwick relates a complicated and exhilarating story of Saul Holiff, in The Man Who Carried Cash. Allowed unprecedented access to Holiff from material his son handed over to Chadwick (audio tapes, correspondence, pictures) we get a glimpse here not only into what it was like for Holiff to manage ‘The Man In Black,’ and what J.C. was really like, but what the music business was like in the nascent days of rock and roll. There is lots here to as much embolden as to dispute the legend of Johnny Cash. If you thought him a musical pioneer before, you will think him more so here. But if you also happened to have ever heard of his destructive ways, in Holiff’s account, told without any punches pulled by Chadwick, you will learn more than you’d ever want to know about country/rock’s bad boy. But The Man Who Carried Cash is as much about Cash as it is his manager; in fact, we get more about Holiff here then Cash, which is as it should be as this book is a bio of Saul Holiff. A man as complicated as Cash, as tickled by his own demons, an ill-suited father lots of the time and also a self-made genius of his own right, building an empire in a business no one, let alone Saul Holiff knew of, we get real insight to what Holiff’s son Jonathan allowed Chadwick access to, and what she so expertly put into this 300-plus page soft cover. Julie Chadwick’s The Man Who Carried Cash is a scrumptious read about men and times long gone by.